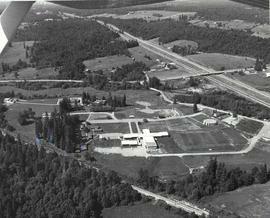 Photograph of campus grounds taken from the east showing Douglas Hall in the foreground and the original dormitories left of that; aerial photograph. Photograph of the central buildings of the TWC campus, including the Calvin B. Hanson Chapel, Vernon Strombeck Library, Arts and Science Building, Douglas Hall, and Original Dormitories, taken from directly above the property; aerial photograph. Photograph of an informal game of football on the lawn in front of the chapel; the original dormitories can be seen in the background. 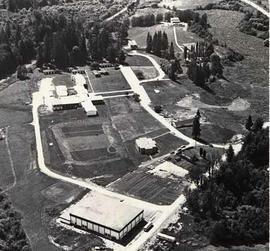 Photograph of the grounds of the campus with one of the original dormitories in the background; taken from the west. Photograph of an external close-up shot of one section of the portables that served as the original student residences.